Welcome To The Introduction to Weapons, Weapon Attachments, and In Game Gear! Here we will be discussing the three subjects mentioned in the forum title. Weapons are an essential part of the game as usually one or more are used to win. Weapons can be found all around the map as well as with custom attachments, gear, and consumables. 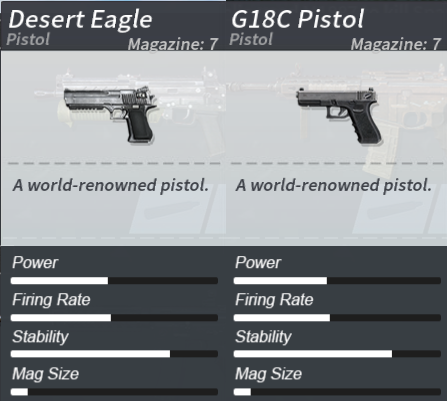 Pistols are the weakest of weapon classes, with low damage, low range and also a low magazine size but don't let that fool you, thousands of players a day are killed by these bad boys. When shot the pistol cannot be detected on the map but still makes a firing noise. The max traveling distance the bullet will travel is 30 meters. Shotguns are known for close range combat and result in death with few shots if used correctly. The shotguns small mag size makes it very risky to use but it pays off big if your bullets land. Damage dramatically drops on long range targets. Shotguns are best used in closed quarters, such as buildings and houses. Snipers are the best long range damage dealers. Snipers vary in many ways, they call come with a scope but not all have the same scope for example the AWM Gives a x4 while the SVD only gives a holo sight, some snipers are semi automatic and some are bolt action, some hold up to 5 bullets and others 20! Assault rifles are best known for there reliable clip size and overall stability in combat and specs. Assault Rifles do not come with any attachments added on. Although the stats may seem similar all of the assault rifles have a different feel! Assault rifles come with a fire rate switcher which can be located on the top of the screen on the left hand side of your weapons the options given are Automatic, semi automatic and burst fire mode. Sub-machine guns are rapid fire arms that pack a punch! Although an assault rifle might hold heavier bullets a SMG can release there's faster and with less spread in most cases. SMGs damage drop over distance is not as bad as the shotguns but still can do decent damage. These weapons are some of the most deadly in the game. M249: Carries a 100 round Clip and can only carry equip scopes. RPG Rocket: A deadly rocket launcher, also hurts yourself if used to close. AUG: One of the most accurate and deadly assaults in the game. AS VAL Holds 20 bullets per clip and is semi automatic with a built in x4 and muzzle! Grips can be applied onto shotguns, submachine guns, and also rifles. Vertical Grip: Effectively reduces horizontal and vertical recoil. Triangle Grip: Slightly reduces horizontal and vertical recoil and increases open scope speed. Greatly reduces h- and v- recoil, and slightly reduces shot spread. Greatly reduces reload time. Reduces shot noise and spread. Expands mag size. Eliminates muzzle flash and slightly reduces all recoil. Shotgun Choke- M4A1 tactical stock. Effectively reduces horizontal and vertical recoil. Greatly reduces shotgun reload time. Reduce 40% of the damage to head move speed. Reduce 55% of the damage to head Restores 10 HP over 8 seconds. Reduces 30% of the damage dealt to body Immediately restores 50 HP. Reduces 40% of the damage dealt to body Immediately restores full HP. increase 150 carrying capacities to carry more properties. increase 200 carrying capacities to carry more properties. Notes Items Missing: Molotov cocktail, Chicken Grenade. Cool guide. A good compilation of the items in-game. There's also the collapsible stock for smgs right? I often see it in Fearless but don't really know what weapon uses it. I'm not a regular at FF so this really helps. Thanks. Thank you for your feed back, Some SMGS can use stocks but they are the same ones that can be applied to Assault Rifles and a few other weapons. To answer your question the open scope speed, This means you will be able to aim your sight faster. dear game moderators maybe its time to add some weapons? Sounds great! Are there some spoilers? Or hints? Nice Guide! Thankz ! Really Helpful!!! !